Antonya Nelson opens her collection of short stories Female Trouble with a quote by Oscar Wilde: “Every woman is a rebel, and usually in wild revolt against herself.” This perfectly captures the women who populate Nelson’s fiction—complex women with a wide variety of thoughts, problems, desires and fears. Her characters are impossible to neatly categorize or pin down. They are self-conscious, self-loathing, self-congratulatory; they are by turns regretful, proud, brazen, unapologetic. Nelson is a master of exploring the interior lives of her characters, and we, the lucky readers, get to come along on the journey. She writes about real people living messy, fluctuating, intricate lives. In her characters, I see women I know. In her characters, I see myself. 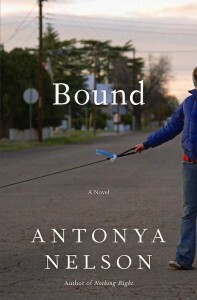 In her latest novel, Bound—which Booklist called “a sleekly powerful turbine of a novel”—we oscillate between the perspectives of a teenage girl, a middle-aged woman, and a seventy-year-old man. She expertly weaves together the perspectives and storylines of these three characters, building up to a dazzling conclusion. And she writes from each of these differing perspectives with sharply honed authenticity and vividness. My heart ached for Cattie, an unflappable teenage girl who flees boarding school. I felt equally drawn to Catherine, childhood best friend of Cattie’s mother and present-day third wife to aging Wichita entrepreneur Oliver. The biggest surprise for me when reading the novel was how Nelson managed to make me care even about Oliver, philandering self-centered wealthy old businessman. Not only care about him, but understand him, too. Even the minor characters in Nelson’s work shine with memorable richness. In Bound, I was captivated by the brief descriptions of the serial killer who haunts the periphery of the novel, a source of horror, fascination, and a strange celebrity for the people of Wichita, and for the reader. Nelson’s writing achieves that rare combination of being compulsively readable and also making a lasting impression. Her characters and their stories linger with you. For me, the true test of a great book is one that stays with me days or weeks or months later, and Bound is certainly one of those great books.